Did you know that May and June are the sunniest months in Ireland? Those months would be a great time to explore Ireland by taking one of our river barge cruises on the Lower Shannon River. Why cruise the Shannon River in Ireland aboard our grand hotel barge? In addition to the luxurious dining and accommodations, there is all the beauty of Ireland to explore. From ancient archaeological sites to modern, bustling towns, you will experience the stunning scenery of Irish islands, lochs, and green countryside from the comfort of your floating hotel. Binoculars are available so you can enjoy the flora and fauna along the lush “Callow” landscape, rich with wildlife, through which you will be passing. With daily excursions in a comfortable coach, you will take a private tour of haunted Leap Castle with its eccentric owner, enjoy a Guinness and oyster lunch, and explore the Clonmacnoise sixth century monastic ruins. Other tour highlights include Birr Castle with its landscaped gardens, shopping for local crafts and gifts, and experiencing the Craggaunowen Iron Age Life Re-Creation Project. Why cruise on the barge Shannon Princess? In addition to a full-length upper sundeck, the Shannon Princess has a spacious open salon and dining room with panoramic views out its large observation windows. Meals are crafted by the Ballmaloe School trained master chef, with highlights such as roast shoulder of lamb and black velvet crepes. 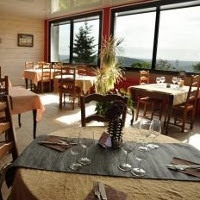 All meals, including wines, local cheeses, and other delicacies, are included in the price. Carpeted throughout, the Shannon Princess accommodates up to ten passengers in spacious cabins with ensuite bathrooms and newly tiled large showers. The cabins also have picture windows and individual heat controls for those inevitable cloudy days. Bicycles are available upon request. Interested in golf, walking tours, artisan visits or family cruises? Shannon Princess is happy to customize a cruise for your charter group with special interests. Are you ready to experience Ireland at its finest? Contact us today to learn more about cruising on a deluxe river barge along the Shannon River. Do you hear the word “cruise” and imagine endless buffets, infinite vistas of ocean water, and wonder if there are more exciting ways to spend a vacation? Are you the type that needs to be active in order to feel alive? If so, then you don’t need to avoid a cruise—you just need to find the right kind of cruise. With the most active of our barge theme cruises, you have the chance to explore the French countryside from the seat of a bicycle, and enjoy as much activity as you desire. On barge Meanderer, Captain George, an avid biker, has designed a series of biking options for each full day of your cruise. If you are also an avid, conditioned biker, he has created 55-85+ mile tours of medium elevation through a succession of scenic towns scattered across the French countryside. If you’re a weekend biking enthusiast, he has a lighter-elevation set of tours which cover 25-45 miles per day and also take you through picturesque villages adjacent to the Briare Canal. Casual biking along the canal and through small villages is also available. One of the great things about combining biking and barging is that you might want to travel with someone who likes time to relax as well as be active. Meanderer takes this into account as well, providing easier biking options along the canal itself for those who want to get off the boat in a more leisurely way. Biking and/or sightseeing – the choice is yours. There are daily tours of fascinating sites, such as the beautiful palace of Fontainebleau, home to generations of French royalty. Or enjoy the ever-changing French countryside, like the 7 locks at Rogny. Built in the late 16th Century, these seven locks (now inactive) are at the point of division of waters between the Loire and the Seine. It is the first work of this type built in France and now classified as an “Historic Monument”. Once you’ve worked up an appetite, whether biking or relaxing on the elegant teak deck of your barging home-away-from-home, you will find the opportunity to sip a glass of French wine and dine on gourmet meals freshly-prepared with local ingredients to be the perfect ending for an active day of biking and cruising. If you’re ready to enjoy this perfect blend of luxury and activity, contact us today to make your reservations. Excellent dining on barge cruises is one of the highlights, usually taken on board with your own chef. The barge Savoir Vivre offers another way with its all-inclusive dinners on shore in a variety of local restaurants. You can choose from the menu and 1/2 bottle of wine per person is included in the cruise price. To whet your appetite for this unique dining experience where you can mingle with the locals and sample six different restaurants, enjoy the restaurant dining guide provided by James Waggott, owner Savoir Vivre. Our clients have loved the variety, authenticity and exceptional quality of the restaurants selected. Transportation is provided, too! A friendly and warm welcome awaits you by Delphine and Christophe Faivre at the L’Auberge Gourmande. Situated in Velars-sur-Ouche. The restaurant is located on a quiet street in this typical village and has two rooms with elegant décor, air conditioning and a pleasant terrace outside. 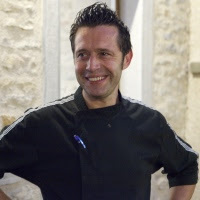 Head Chef Christophe learned his craft at the Moulin de Saint Remy Martorey, Guy Savoy, Negresco, Girardet in Switzerland as well as spending seven years abroad (Tel Aviv, Israel, Rio, London, and on a private yacht for a billionaire Englishman). So his credentials speak volumes. The result of all this effort? A recent restaurant critic declared that this restaurant offers a “pleasant setting for a restaurant that is going places, the food was exquisite”. Menu Highlights – Specialities include eggplant tartare with balsamic vinegar, espuma melon lemon balm. Cromesquis fried ham with parsley, Burgundy escargot, hummus, and wild garlic. Confit of lamb shoulder in kefta stuffed with tomato reduction, rosemary and paprika. Its no surprise that this restaurant is tipped for big things, we’ve caught it during its ascendency, we think this is the “Savoir Vivre” time to visit. 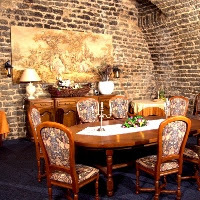 To demonstrate our commitment to offering new levels of experience and value, we are offering dinner in the renowned L’Abbaye De La Bussiere for our 2014 passengers. The setting is magnificent and the head chef, Emmanuel Hébrard, is a genius. We dine at the more relaxed Bistrot section of the restaurant – i.e. the Savoir Vivre way to dine in such a magnificent setting. Just as in the more formal gourmet restaurant, it uses the best products of the season and is of the same quality. This is an indulgent and exciting restaurant which significantly enhances our already unique experience. We are delighted to offer it for all of our 2014 passengers. It is common in France for authentic restaurants to sit within a hotel. Moreover, it is not unusual for the restaurant to be the star of the show! 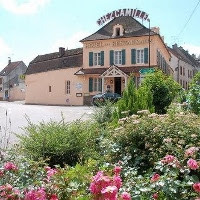 This is exactly the case with Chez Camille, a traditional, elegant and interesting restaurant set within the building of the modest Chez Camille Hotel located in the centre of Arnay le Duc, itself a quaint and pretty town. 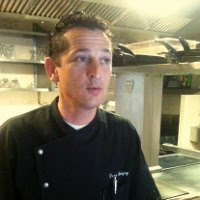 Proprietor Arman Poinsot is as French as they come with the style and composure straight out of Disney’s Ratatouille! Head chef Pascal Godillot’s kitchen works in step with Mr Poinsot – the food is traditional with occasional complex highlights to attract the eye of the sophisticated and adventurous diner. The dining area is fabulous with traditional round tables but with decidedly untraditional features such as a tree canopy and glass viewing areas to the kitchen where a team of crisp white clad chefs are hard at work. This restaurant offers a French dining experience at its most traditional routes. The building, décor, ambiance, proprietor, and menu all hark to an era which so many restaurants around the world strive to emulate. This is a rare example of the real thing and is an essential cast member of our dining experiences. Menu Highlights – How about a caramelized pineapple and vanilla zabaglione with gingerbread and rum sorbet?! Other highlights include everything from traditional Burgundian favourites such as Coq au Vin and Boeuf Bourguignon to more adventurous dishes such as walnut sweetbread cutlet with juice reduction, spinach, mushrooms and parmesan crust. Long before her Michelin Star grade owners took residence, the site of the Ferme de Rolle experienced a fascinating history involving peasants, pig farmers, and soldiers gaining a strategic advantage. Over a century ago sixteen households (pop. 30) lived in and around the current building – three wells assured water supply to the modest community. In 1933 the buildings and surrounding land were converted into a pig farm. A Mr George Flacelière developed and later sold the farm to a Mr Denvin. However, during the Second World War, in addition to his pigs, Mr Denvin played host to the Canadian allies. The site held a strong position being very close to the farm of La Belle Emélia Saint-Jean-de-Boeuf, occupied by the German army. In 1975 the entire site was given a new lease of life through its conversion into a fabulous restaurant which it has remained ever since. Since spring 2004, the Sangoy family, who previously owned the Michelin Star awarded ‘Gevrey-Chambertin’, have taken the restaurants to new gastronomic heights. Menu Highlights – The house speciality is ham roasted over an open spit right in front of you. This hearty traditionally prepared dish compliments this wonderfully historic restaurant, don’t miss out on it! This is a very special restaurant in the countryside of Burgundy and “the Route des Grands Crus”, it quite rightly sits at the heart of our restaurant selection. Rather like the Chez Camille (above) ‘Le Spuller’ is set within the ‘Hotel le Spuller’. It is located in Sombernon, a village of approximately 800 residents nestled in a location equidistant from Dijon, the Côte-d’Or vineyards, Chateauneuf and Beaune, talk about location location location! On top of this are the views offered by its hillside location, they are absolutely magnificent! However, It is the restaurant itself that really caught our attention and that of many local residents. The dining area offers panoramic views of the valley below – it is a perfect setting to enjoy a lovely dinner while afternoon turns to evening. The food is of an excellent standard with charming staff and a menu which offers something for everybody. Our 2013 guests have universally adored Le Spuller. The combination of quality, setting and exceptionally friendly and amiable service hits all the marks. Menu Highlights – The food at Le Spuller is unashamedly simple. Elegantly, authentically, and tastefully so. This is in contrast to some of our more avant-guard restaurants and sits nicely in our selection. This includes Oeufs en Meurette and other Burgundian classics. Other highlights include roast trout with Emmental and ginger cream and the ”Salade Spuller” made with an Epoisse cheese gougère pastry. ps – the kitchen is also very flexible here, a simple child-friendly pizza can be catered if so desired! Chateauneuf en Auxois is a rarely beautiful place. This hilltop medieval village is one of the last remaining examples of 14th century Burgundian military architecture. During the Hundred Years War, towers and curtain walls were built to defend the village and the Auxois plains. Many still stand to this day. 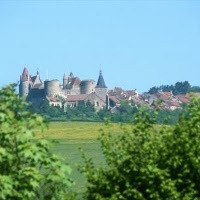 From the 14th-17th centuries wealthy Burgundian merchants built houses at Châteauneuf-en-Auxois. One such house is now home to “l’Oree du Bois”! This gem of a restaurant sits comfortably in this fascinating location. Rather than focus on traditional Burgundian cuisine, “l’Oree du Bois” (roughly translated ‘Edge of the Woods’) has chosen to focus on another French culinary bastion, the ‘crêperie’. Those unfamiliar with this type of restaurant need not worry, we’re not just talking about Nutella and Grand Marnier pancakes here! Authentic French creperies started in the Brittany region but later became widespread across France and are now considered a national dish. It would be a shame not to visit one on a culinary tour of France! Authentic creperies offer a wide range of savoury (and sweet) crepes each made with skill care and attention using locally sourced ingredients. 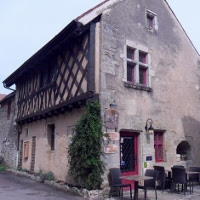 The restaurant itself is barely noticeable from the outside with its ancient historic building perfectly and correctly untouched. Once inside, however you are greeted with vaulted ceiling with a very pleasant central fireplace and mezzanine dining level. A quiet amble around Chateauneuf is the ideal way to finish off your evening. We can suggest a spectacular vantage point just one minute’s walk from l’Oree du Bois from where, weather permitting, you will have a stunning view of the green and lovely land that is Burgundy. At times restaurants may be unavailable due to special occasion bookings, seasonal closures etc. In these instances we have several other high quality restaurants to choose from, all of them are up to our standards. Family Barge Cruises on 8 passenger Savoir Vivre in Burgundy. For more information, have a look at Savoir Vivre’s barge page and more photos. Ready to go barging? Please contact us today to select and book your barge cruise.